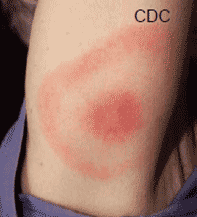 Lyme disease is an illness caused by the bacteria Borrelia burgdorferi (B. burgdorferi). In the last five years, an average of 20 people per year, infected with Lyme disease, were reported to Toronto Public Health. Most of these people acquired the disease outside the City of Toronto. However, in 2017, there was an increase in cases that likely acquired the infection from tick bites occurring in Rouge Valley. Signs and symptoms usually occur one to two weeks after a tick bite, but can begin as early as three days to as long as four weeks after a bite. Contact your doctor promptly if you develop symptoms of Lyme disease. To get Lyme disease, a person must be bitten by a blacklegged tick (or deer tick) Ixodes scapularis that is infected with the B. burgdorferi bacteria. A healthcare provider will perform a clinical assessment and take a detailed history of possible tick exposure. Blood work can also be done to test for Lyme disease but should not be the sole factor in determining if someone has the disease. Blacklegged ticks have recently been found in Toronto suggesting that these ticks are becoming established here. The risk of acquiring Lyme disease in Toronto is believed to be low. Ticks are found in wooded or bushy areas with lots of leaves on the ground or where there are tall grasses. Lawns, mowed grass, sports fields or paved areas are not where blacklegged ticks are usually found. Ticks cannot fly or jump. Instead, they rest on the tips of grasses and shrubs, waiting for a host (person, animal or bird). 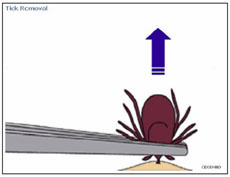 If a person brushes the spot where a tick is waiting, it quickly climbs aboard. It then finds a suitable place to bite. Ticks can attach to any part of the human body but are often found in hard to see areas such as armpits, groin and scalp. The greatest risk of acquiring Lyme disease occurs where populations of ticks that carry the bacteria that causes Lyme disease, have become established. In Toronto, this includes Rouge Valley and Morningside Park. However, as tick populations are expanding, it is possible that Lyme disease can be picked up outside these areas. In addition, ticks can travel or migrate on the bodies of animals such as birds, and therefore can be present in an area for a year in very low numbers then go away. This happens over a broad area of Ontario including Toronto. There are effective antibiotics available for treatment if your doctor diagnoses Lyme disease. If the tick was attached for 24 hours or more, your doctor may prescribe an antibiotic to prevent Lyme disease. The antibiotic must be taken within 72 hours from the time that the tick was removed. There is no vaccine available in Canada to prevent Lyme disease. After spending time outdoors in wooded or bushy areas, shower to remove ticks before they become attached. Check your full body and head for attached ticks. Ticks feed on rodents, deer and birds. Discourage rodents by sealing stonewalls and small openings around the yard. Use plantings that do not attract deer or exclude deer by fencing. Keep bird feeders away from the house. Ticks that are sent to Toronto Public Health can be tested to determine that the tick is the blacklegged tick and can be further tested to see if the tick carries the B. burgdoferi bacteria. Please note: Tick submissions from Rouge Park, Morningside Park and Algonquin Island will no longer be forwarded to the public health lab for identification since blacklegged ticks are known to be established in these areas. Toronto Public Health works to prevent and reduce the spread of Lyme disease in humans through surveillance of ticks and human cases, as well as by providing recommendations for the management of human cases. 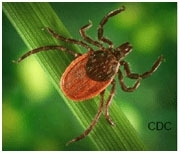 Transmission can occur when a tick has been attached to a person for at least 24 hours. Call Toronto Public Health or speak to your healthcare provider.